I have been teaching for 24 years now and at the age of 47, and as it’s the summer holidays, this much I know about why Joe Strummer still matters! 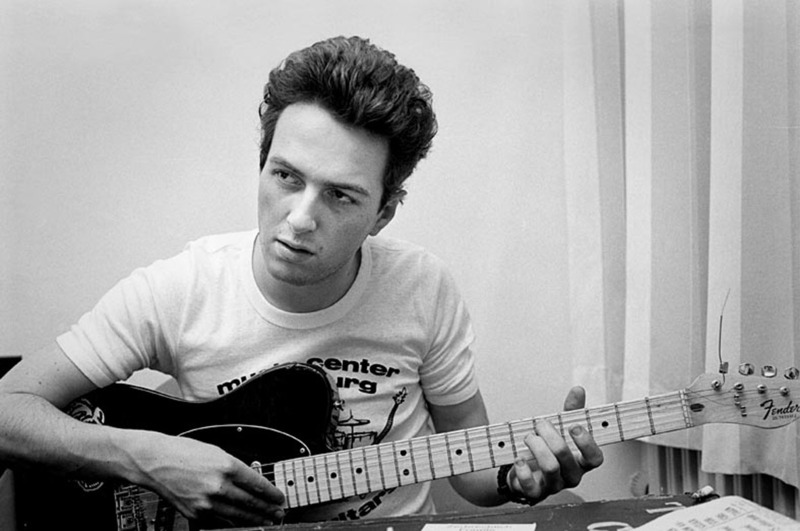 The single most important influence on my life was, and still is, Joe Strummer. I know that sounds an extraordinary thing to write, but it’s true. Strummer’s politics, determination to succeed and appetite for hard work shaped my view of the world and how I lead my life. My eldest son is, predictably, called Joe; how I got that past committee I’ll never know. It is difficult to tread certain lines as you grow up. As the father of a fifteen year-old boy, I am aware that teenage rebellion can be manifested as deliberate lethargy, but Strummer’s work hard/play hard approach to living liberated me to do my studying, become a top amateur golfer, and be a teenage rebel. It was a bizarre mix – Sussex Junior golf champion and committed punk rocker; I ended up being a state secondary school Headteacher to boot! In my work as Headteacher, Joe Strummer still drives everything I do. I have a portrait of him above my desk. 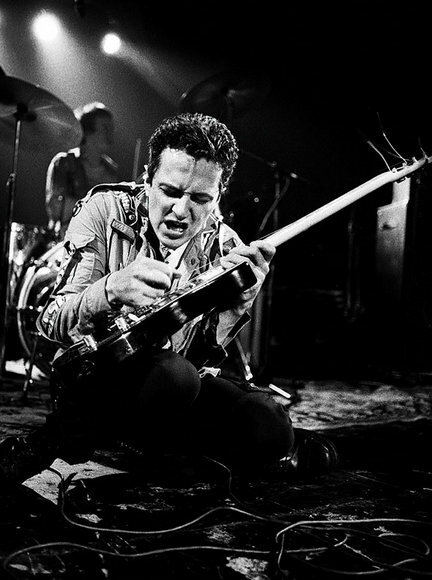 In Tory-led Coalition Britain, I think my job is about putting humanity back into the centre of the ring; our values are Respect, Honesty, Kindness, a set of values to which, I think, Joe Strummer would subscribe. I am very clear indeed about whose side I am on – the students’. Being a Headteacher is my way of inspiring young people and shaping the world; Strummer did the same thing but in a much more attractive way! I tried playing guitar about four years ago and failed miserably, getting stuck at Yankee Doodle Dandy. My son Joe plays effortlessly, and even though he’s currently into rap, I sometimes hear the odd Clash riff emanate from his room. My old maths teacher once explained to me that The Clash were rubbish and that I wouldn’t be listening to them in thirty years’ time. He was so very wrong. Joe Strummer was never afraid of hard work. His mantra, No output without input, is the age-old parents’ moan at teenagers, You only get out what you put in, repackaged for the 70s punk generation. He probably worked his hardest on stage, with his Strumguard the only thing stopping him from bleeding to death from a hole in the arm. When I practised golf for seven hours a day, my hands bled and I strapped up my bloody fingers like Strummer did his arm. Last year’s riots echoed the world of my 1981 youth. Explore Google and you’ll find that the images are incredibly similar. I produced a short talk for our History students on the parallels: the unemployment, the burning buildings, the newspaper headlines. What was great for me was being able to play the whole of White Riot in an assembly and be wholly justified in doing so! There was/is nothing quite like being in the mosh-pit as the Clash began their set. The first live track I heard them play was Clash City Rockers. Those opening chords growled out across the Brighton Top Rank and the surge of energy was raw, elemental and purifying. I still love the mosh even now; I saw From The Jam recently and lost my glasses through an elbow to the temple mid-way through Going Underground. I reckon Bruce Foxton must have been in middle-aged despair when my fellow-moshers stopped and helped locate my missing specs. I last saw Strummer and The Mescaleros at the Leadmill in November 2002, the penultimate gig before Strummer died. They finished with White Riot and Strummer thanked us for coming. On the bootleg CD my southern-accented shout of Sttrrruuuuummmer! is clearly audible just before they begin White Man. I bored friends for a long time afterwards with that one. My two sons quite like the Clash. We sometimes sing Stay Free together in the car, with me turning the sound down when Mick swears. When he was twelve I took Joe to Mick Jones’ Rock and Roll Public Library underneath the Westway, but the Portobello Market Rastafarians were a bit scary for him and he wanted to get back to the Apple shop in Oxford Street. The trouble is, as Helen Love points out, The Clash were thirty years ago. My attempt to interest my boys in The Clash is the equivalent to my dad, in 1978, encouraging me to listen to Pee Wee Hunt’s 1948 hit Twelfth Street Rag. That said, when I hear London Calling blaring out in the sixth form common room my hope that my boys will like the Clash re-ignites. 9 Responses to This much I know about…why Joe Strummer still matters! London Calling was played constantly during the Olympics, so it is now a favourite of my 11 year old, 9 year old and 6 year old. That’s legacy. I would argue that it wasn’t played enough! How fantastic and, in some ways, amazing that your early philosophy has never let you down and that it still shapes what you do. Brilliant. You’ve known me long enough to know how ingrained certain things are…! You should have listened a bit more closely to Joe. You’re very welcome to visit our school. You might gain a different view. It’s a long time since I heard anyone mention the Top Rank Suite! Didn’t get to see The Clash there unfortunately.